Chop the dates as small as possible then mix with condensed milk. Crush biscuits then add all dry ingredients and mix. Add the condensed milk mixture to the dry ingredients and mix all together gently. 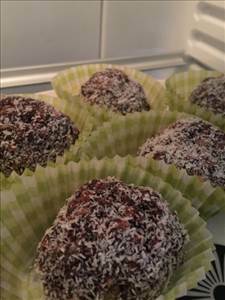 Separate into 8 serving sizes and roll into balls then coat with more coconut. Leave in the fridge for at least an hour to allow the flavours to mix and hydrate a little. There are 337 calories in 1 serving of Seed 'n' Nut Choco Coconut Balls. Calorie Breakdown: 48% fat, 42% carbs, 10% prot.